PROS: Feature rich, yet simple UI. Easy to use. Great audio quality. VERDICT: Simple interface that is easy to understand, yet powerful with a lot of goodies under the hood. This is one of those programs that keeps on surprising you. Looking for that great program that delivers what it promise on the cover isn’t easy. Most of the time, programmers promise one thing and deliver something else, or you find that the program you just got hold of is lacking that particular functionality you are looking for. Every once on a while I stumble across a program that not only deliver what I’d expect but actually more. This is one of those moments. Read more after the Jump. The Apowersoft Streaming Audio Recorder (phew, that’s a mouthful) sounds like a program that is designed to do just the one thing. Record Audio. You would think. It is. But it’s also more. A whole lot more. Not only can you play music on your streaming service of choice and record whatever is playing. The program also detect song information and can split the recordings into multiple files when it detects that a new track is playing. But that’s not all. Ok, so you’ve done your recording. Now what? Well If you failed to check the option to let ASAR automatically split your recording into tracks, or ASAR couldn’t detect the tracks (as it would have trouble doing recording from a commercial radio station). What do you do? Simply Right Click the recording from the available list, and choose Edit. That’s right ASAR comes with its own audio edit feature allowing you to edit the recording, join multiple files, extract portions of the recording and then convert it to whichever format you choose. It’s not often I get impressed with a tiny program such as this one. But this time I did. 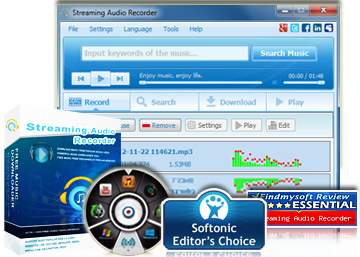 If you are on the lookout for a great, easy to use and powerful audio recording tool. Then look no further. But don’t just take my word for it.